A significant reduction in service users’ psychological distress was observed after completing the programme. 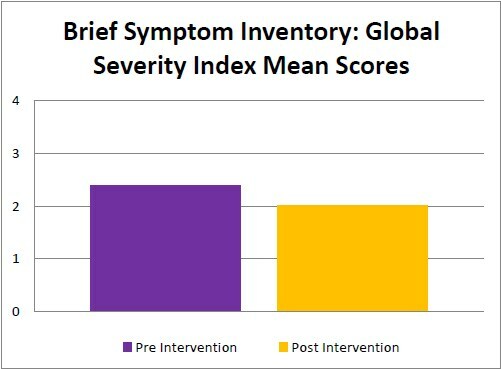 This was shown by a reduction in mean scores on the Global Severity Scale on the Brief Symptom Inventory (BSI), whereby t(20)= 3.50, p<.05, reflecting a medium effect size (d= .57). A significant change was also observed on the SCS-R, whereby t (30) = 4.32, p< .05, reflecting a medium effect size (Cohen’s d=.79), suggesting that after the programme participants felt more connected to their social world. Table 1: Results from paired samples t-tests for measures pre and post Radical Openness intervention. 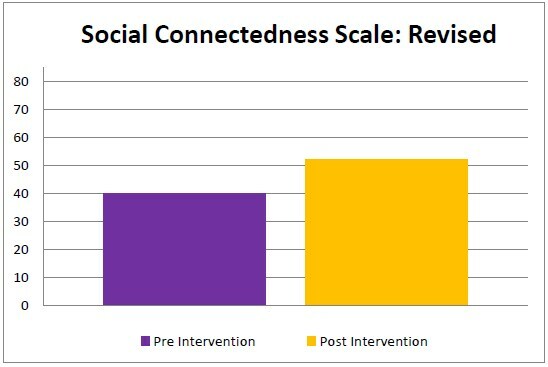 BSI=Brief Symptom Inventory, SCS-R=Social Connectedness Scale-Revised.